We take care of everything ! 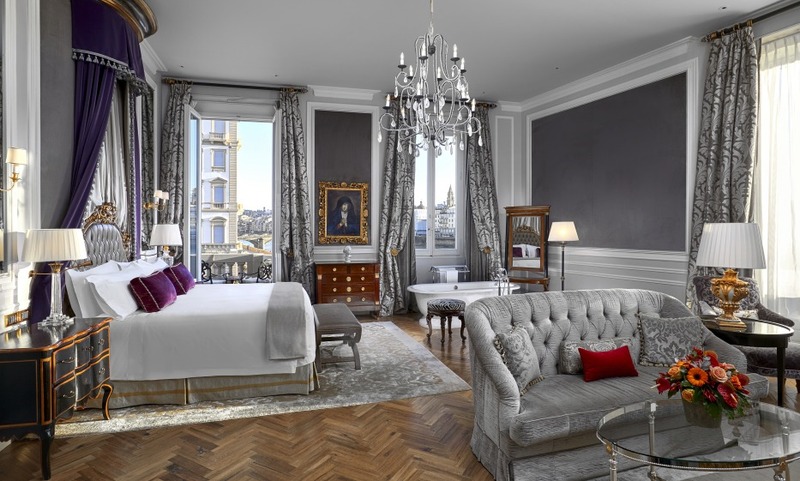 For a complex booking, contact our Guest Experience Managers on +44 20 3519 2700.
the St Regis Florence delivers old world grandeur, five-star service, and an exceptional location that’s literally a stone’s throw from the Arno River. It’s as Florentine a hotel as they come, and every room – whether it’s a “ Medici”, “Fiorentino”, or “Renaissance” style – offers a distinctive flavor with richly colored fabrics, canopied beds and frescoed ceilings. The rooms facing the Arno offer the ultimate sense of place, with sounds of the bubbling river a near constant along with views of the Oltrano district and in the distance, Florentine wine country. For your mandatory cultural tour of Florence, start right at the St Regis Florence’s lobby. Built in 1432, there’s plenty of history to marvel at here with the original features and frescoes left intact. As for a bit of trivia your Butler will happily regal you with tales of former illustrious guests including the Maharaja of Kolhapur who passed away here, but will remain notoriously tight lipped when quizzed about the comings and going of modern celebrities which include the likes of Madonna and Keith Richards. For the epicures, the recently opened Winter Garden offers Tuscan Michelin Star Cuisine which can easily challenge longer established eats. Discover an innovative cuisine concept serving unforgettable flavours thanks to the collaboration with the two-Michelin stars Valeria Piccini by Caino. Choose rooms on the river side to enjoy unique and unforgettable Arno river view ! It is one of the most beautiful hotels I stayed, the whole staff was very professional and friendly. I already had been there 3 times and the service always was perfect. I thoroughly can only recommend this hotel for everybody who want's to have a memorable stay at Florence. Beautiful facility, excellent services, friendly and efficient staff, great location .. quality breakfast &amp; drinks. An excellent hotel that we could not fault. Would have no hesitation in recommending it to all. Superb hotel. Top of the line here in Florence. The service is outstanding and the guys at guest service really did a spectacular job. They saved us valuable time with their knowledge, and connections of how to move around. Can't wait to return. Exceptional hotel, attentive staff. Stay was almost perfect !